The largest luxury ski chalet in Europe at approximately 3,200sqm over 7-floors and found in the absolute best ski location in the world, the Bellecote Slope, 1,850 meters above sea level in Les Trois Vallées (the largest resort ski-area in the world); and yet just a 5-minute walk into the buzzing village of Courchevel 1850. The two-year construction finished in 2012 in a stunning alpine style with beautiful wood-beamed interiors, cozy fireplaces and a warm traditional feel, while maintaining all modern amenities. Edelweiss has 8 substantial double bedrooms suites and is truly unbeatable in luxury chalets, with a huge ski-room, large pool for swimming and diving, Jacuzzi and hammam, independent massage rooms, huge gym, fantastic cinema and indoor garaging for numerous cars with its own car-wash. There is also your very own nightclub with bar, dance floor, DJ booth, strobe lights and giant waterfall tumbling past the bar into the swimming pool on the floor below. Ideal for special family parties, all of which can be arranged. The location is impossible to beat, skiing straight out of the ski room and onto the Bellecote piste. 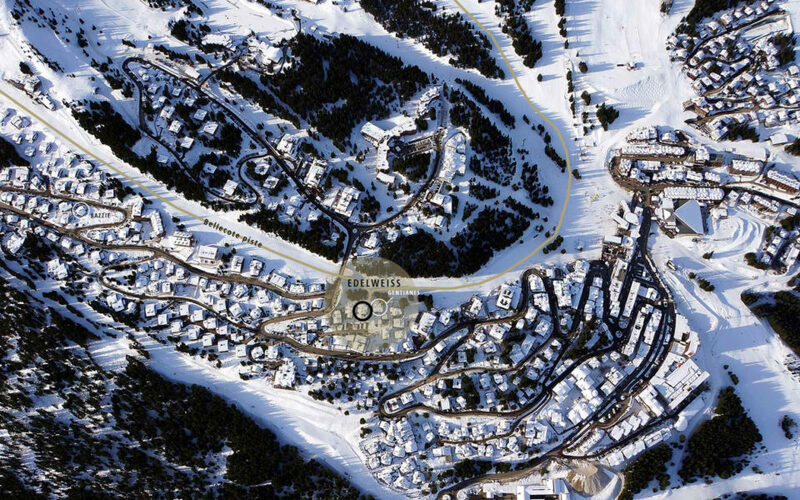 The chalet is away from the main road in a private residence, with the center of Courchevel 1850 just a five minutes' walk down the slope to its renowned restaurants, bars, shopping and nightlife. It can be connected to Chalet Gentianes underground, and can be hired as a 15-bedroom estate. Edelweiss is the 200m super-yacht equivalent of skiing holidays. Edelweiss has 12 live-in staff to cater for all your needs. Your exact preferences meals, wines, etc. A car lift provides access to an underground garage for 20 cars, a lift that gives access to all levels as well as a magnificent spiral staircase. There is a separate staff lift, stairway and entrance ensuring complete privacy. The spa floor is rivalled by none. A 14 meter pool with Jacuzzi features a waterfall surrounding a sky light, a bar; hammam and sauna are also found here. On the same floor is a double therapy room and a large independent gym. Chalet Edelweiss also houses some incredible artwork (please see art in Courchevel Prestige Chalets). With a team of highly motivated and dedicated staff, chalet Edelweiss can be a haven of tranquility, an adventurous ski experience, an entertaining and sociable sojourn - a perfect holiday for those wishing to experience all that Courchevel has to offer. Chalet Edelweiss is located right on the Bellecôte piste (ski in ski out) nested in the prestigious and quiet Residence de Bellecôte and 500 meters from the village of Courchevel.